Pictured are medal winners in the COPS long-distance championships. From the left are Poppy Richardson, Amelia Monaghan, Harvey Norman, Christie Woods, Harry Whiteman, Bethany Saunders, Daniel Leigh, Katie Brown and Rachel Wellings. 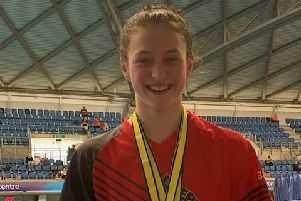 Katie Brown was a double winner when City of Peterborough Swimming Club (COPS) held their long distance championships at the weekend. In Friday night’s 400m races Brown finished first out of 29 swimmers in the girls 9 years and over freestyle race, which attracted 29 girls, by a 4.86-second margin. Second place went to Bethany Saunders (16) while the next three girls were separated by just 26 hundredths of a second with Christie Woods (14) just edging out Poppy Richardson (14) and Madison Saunders (13) to take the bronze medal. Fifteen swimmers took part in the boys 9 years and over freestyle event and this was won by 16 year-old Thomas Wiggins. He finished 4.6 seconds clear of Harry Whiteman (15) and once again the bronze medal battle was close with Harvey Norman (14) pipping Jaxon Simmons (15) by four tenths of a second. In the 400m individual medley races 22 girls and 14 boys took part. In the girls 9 years and over competition the gold medal was taken by 15 year-old Rachel Wellings with a lead of 4.12 seconds over second- placed Richardson. Amelia Monaghan (13) took the bronze by four tenths of a second from Mia Leech (13). In the boys 9 and over competition 16 year-old Daniel Leigh won by a massive 13.5 seconds from Whiteman with Norman again taking the bronze medal. The 800m championship for girls and 1500m event for boys were held at Corby on Saturday. Whiteman improved on his two silver medals in the 400m events by taking the 1500m gold medal with Norman claiming the silver and Simmons grabbing the bronze medal. In the girls 800m freestyle competition Brown and Saunders went head to head through the first 600m metres but Brown kept her pace consistent from start to finish and she nudged ahead to win her second gold medal withSaunders having to settle for silver again. Richardson set the third fastest time to take the bronze medal.